The Helotes Heritage Association and the Scenic Loop – Helotes Creek Alliance exist to protect and preserve our precious neighborhood. If you have concerns there is an opportunity to make your voice heard at the Helotes Planning and Zoning Committee meeting where this office building development will be presented. Join us at Helotes City Hall and sign up for Citizens to be Heard, April 2, 2019 at 7:00 PM. This message is to inform our neighbors of a planned office building development at Scenic Loop and Marnoch Road. The old stables property (click link to see where this is planned) will be the future headquarters of the Judicial Service Company. 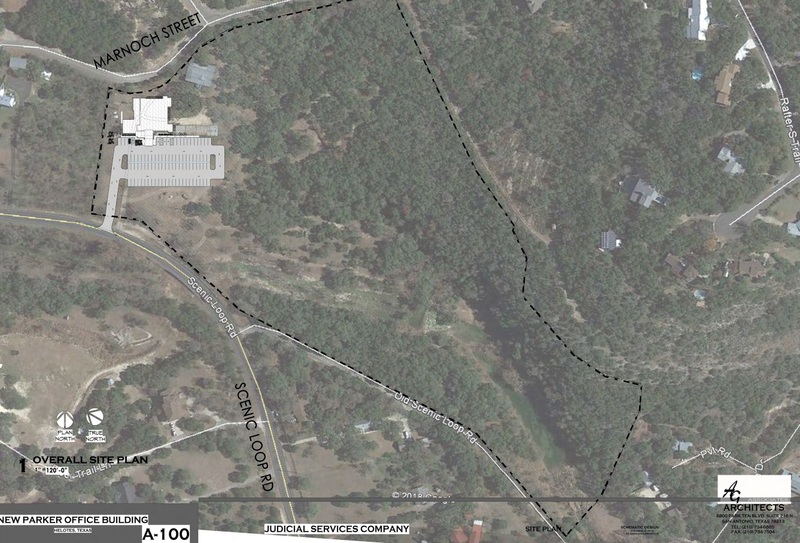 The building is planning on being placed where the stables are located today and the entrance will closely follow the existing driveway off of Scenic Loop Road. Judicial Services Company will be the only tenant occupying the building with their 42 employees. The building was designed to accommodate the companies continued growth and is tucked into the top left corner of the property. The company owners have no plans or desire to expand either the building or the parking lot in the future. The large undeveloped portion of their property will be utilized for walking trails for their employees as most of it is in the flood plain. Water – They do plan on using municipal water supplied via Marnoch Road, but the plans also contain a rain water catchment system for landscape watering. Sewer – Plans are to utilize an aerobic septic system for the office buildings bathroom and kitchen needs. No municipal sewer infrastructure will be extended for this project. Parking – The owners are still working with their architect on parking lot material and are open to investigating pervious cover solutions depending upon cost as opposed to asphalt or concrete. Building facade – The building meets Helotes guidelines by using approximately 75% limestone on the exterior, which will also be complimented with corrugated metal panels and many windows. Traffic – The office are open for business Monday – Friday from 8:30am to 5:30pm and closed on the weekends. Due to where most of their employees live they anticipate they will be using Bandera Road when arriving and leaving work. Lighting – The design specifies the type of lighting utilized for the building and the parking lot. External building lighting will be landscape lighting that faces up from the ground onto the buildings exterior. Some of which will be left on after hours for security purposes. The parking lot lighting will be down lighting and will be turned off over night. Section 8.1 Design Standards The City of Helotes is proud of its rural heritage and strives to maintain that aesthetic and sense of community within its commercial districts.